Duck with Chestnuts, or Pato com Castanhas, is a traditional recipe during the holidays in Portugal. The rich flavors of the roasted chestnuts and prunes truly add a unique flavor to this wonderful holiday dish. The duck is first briefly seared and then baked to give the meat a tender and delicious texture. Served alongside roasted potatoes this dish is quite hearty and perfect for when serving with guests. 1) Sear the duck on both sides in a large frying pan on medium high heat with 1/2 cup olive oil. 2) Remove the duck and in the same frying pan sauté the garlic, onions and mushrooms until golden. 3) Add the wine, Worcestershire sauce and the juice from the orange. Let it boil for one minute while stirring then turn off the heat. 3) Boil the potatoes for about 20 minutes. 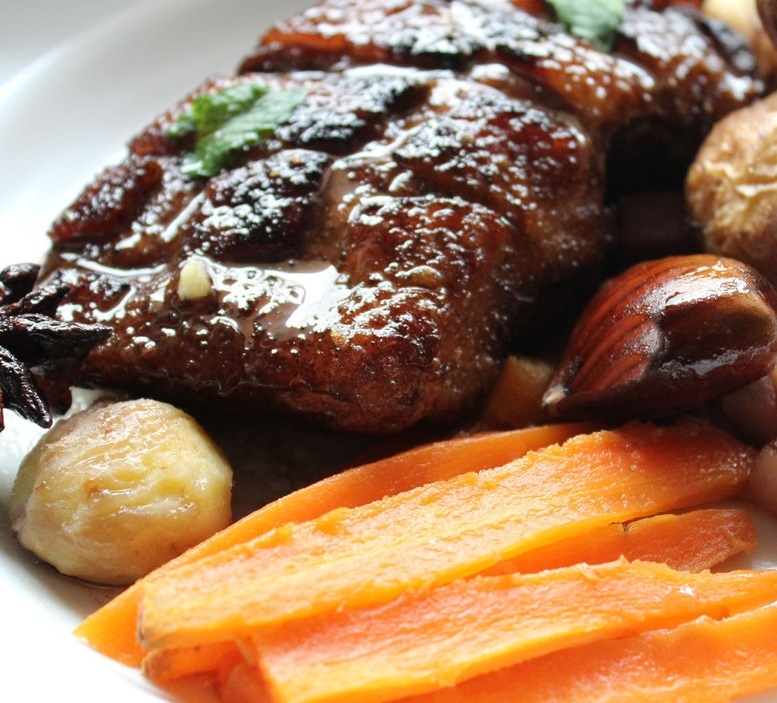 4) In a baking dish place the duck, potatoes, chestnuts, sliced carrots, and sauce from the pan. 5) Bake for 1 hour at 350 degrees fahrenheit until the duck is well cooked and tender. 6) Add prunes and bake for another 15 minutes. 7) Remove from the oven and let cool for 5 to 10 minutes. Before serving decorate with the rosemary.